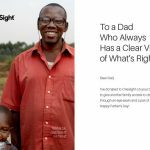 Give a Father’s Day gift you won’t find in any store: clear sight for someone who has no way to get it now. Donate $30 to give a father, mother, or child in need an eye exam and a pair of glasses. A simple pair of glasses can help a child do up to twice as well in school, or a worker earn up to 35% more. It’s an easy way to change someone’s life for the better, and it takes just a few minutes. You can download and print this card to let your Dad know you’ve fueled someone’s potential in his name. Thank you.